The responsibility for protecting and restoring natural resources is assigned to certain federal agencies, states, and tribes. Under several federal laws, NOAA is a trustee for coastal and marine natural resources, including marine and migratory fish, endangered species, marine mammals, and their habitats. 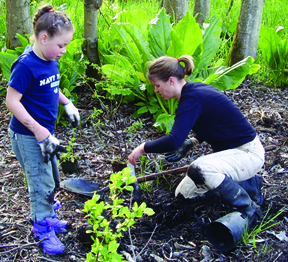 Volunteers plant vegatation to restore a section of Commencement Bay, WA which was injured by hazardous releases from industrial activities. Environmental protection during cleanup. Our experts provide guidance to the agencies who lead cleanup at oil spills and hazardous waste sites (such as the U.S. Coast Guard or U.S. Environmental Protection Agency). Our technical expertise maximizes the benefits of the cleanup and minimizes any adverse effects of cleanup activities on natural resources. Natural Resource Damage Assessment (NRDA). We work with other natural resource trustees to conduct a natural resource damage asessment (NRDA). The NRDA process evaluates the extent of injuries to natural resources and the services they provide. It also determines the type and amount of restoration required to compensate the American public for those impacts. Environmental restoration. Through the NRDA process, NOAA works cooperatively with government agencies, Native American tribes, private companies, nonprofit organizations, and the public to carry out restoration projects at hazardous waste, oil spill, and vessel grounding sites. Since 1990, more than $10 billion has been recovered from responsible parties to restore injured streams, wetlands, beaches, coral reefs, and other coastal and estuarine habitats. Habitat restoration benefits fish, birds, and marine mammals, as well as local and regional economies.